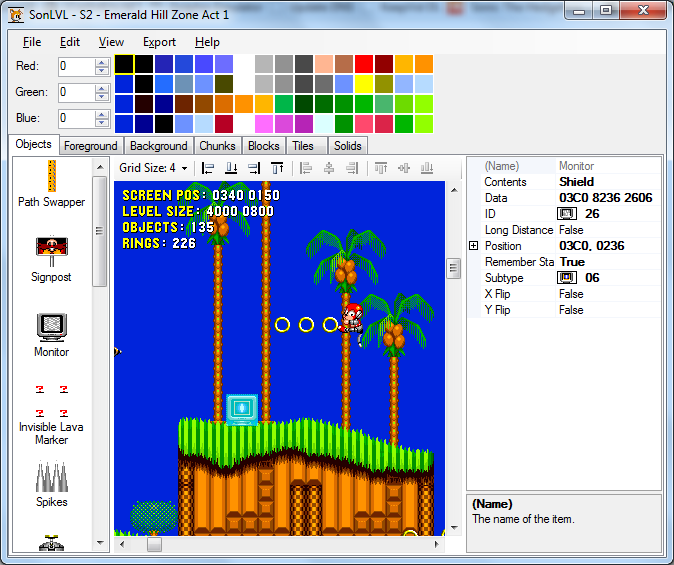 SonLVL is a level editor for disassemblies of Sonic 1, Sonic 2, Sonic CD and Sonic 3 & Knuckles (additionally supporting S&K Collection and Sonic CD PC). It is designed based on Visual Studio, for people that don't like SonED2's interface. It uses art and mappings data from the disassembly to display objects more accurately than SonED2 can. wow that's really good! will it have support for S1 as well? I'd like to try for S1 and S3K after I get S2 fully done, but I'll probably have to make them separate programs. Wow, that looks good. Is this for roms or dissasemblies? Does anyone edit ROMs anymore? Oh wow, that's awesome! Tell me though, will it load seperate files (layout and such) similar to how you load certain aspects in SonMapEd, a file with file locations akin to SonED2, or something different from either of these? It uses an INI file containing the relevant information for each level, along with an INI file for common objects, and an INI file for each level for level-specific objects. But not because I couldn't use it. Hell, I had no real problems with it's usability; just an interface that wasn't built for humans. MainMemory, I've been away from this place so apologies if you've already said or not but; is there to be any graphic-editing (drawing tiles in the editor) capability in the program? FeliciaVal: I don't know about that (the other Tech Members have been completely unhelpful in that regard), but it's certainly different. The only keyboard controls are moving the camera, and delete to delete objects. Jayextee: Yes. Not sure if it will be there in the first release. MainMemory, is the Sonic 1 editing program going to work with the .sep project files? Because this is looks more fantastic than SonED2 and with those annoying '?' symbols which make me place objects without some pixel precision. No. It will use INI files, like S2LVL (and everything else I make). Converting .sep files to INI is rather trivial, if you REALLY want it, I could make a program to convert them. Of course, if you haven't edited the .sep files at all, then the default INIs will work just fine. I wasn't expecting this many replies, given how none of the techies seemed to care. The techies are probably good with what's out now. However, that's still a far cry from the normal user. I will say that I didn't look because I'm not interested in Sonic 2 hacking...yet.